I have always loved war comics. Unlike war movies, they often allow space to understand characters, and while many of them are steeped in easy cliché, there are a lot more that try to dig into the strength of character it takes to survive military conflict. 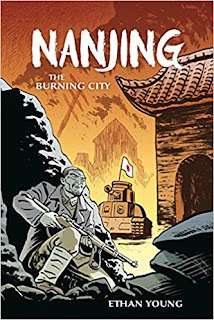 Ethan Young's Nanjing: The Burning City, is a very effective war comic. It focuses on two Chinese men, a Captain and one of his men, who have somehow managed to survive Japan's taking of their city, and after their command structure fled, find themselves stuck in a ruined and occupied city. They have some difficult choices to make. Lu wants to make for the Safety Zone, a space reserved for refugees and watched over by Germans who are working with the Japanese Army (this happened in 1937, during the 2nd Sino-Japanese War, before the madness of WWII absorbed this conflict). The Captain does not think they should do this, and instead wants to try to make his way out of the walled city through a particular gate. The two men have to continue to make difficult choices as they make their way through the ruins. They hear some soldiers attack a mother and her daughter, but have to deal with the fact that they can't do a thing to help. Likewise, they have to turn down an old man's request for help, knowing that to leave him is to kill him. Young, with his large panels, quiet scenes, and excellent facial expressions, makes this story tense and kind of horrible. The Captain is a typically stoic military man who is doing all he can to hold it together, although when the pair meets a young family, they have to change their plans. I really enjoyed this book, which helps to bring this story to a larger audience in North America, where the Nanjing story is not really taught or discussed often.